On January 29, 2014, friends Mariabruna Fabrizi and Fosco Lucarelli posted an interesting article on Socks (check out their new interface!) based on photographs taken by Mike Ma of a map illustrating the chronology of the bloody week (May 21-28 1871) that eradicated the socialist Paris Commune. Seeing this map made me want to, not only retrace it in a “cleaner” version but add to it other valuable information so to obtain a comprehensive “chrono-cartography” of the 1871 Paris Commune. You can download a high-resolution of this map here under a Creative Commons Attribution-NonCommerical-ShareAlike 4.0 International license (i.e. use it in any way you want providing that you’re not making money out of it and that you’re referring to the original map’s credits). This article is built on five chapters that distinguishes each component of the map. 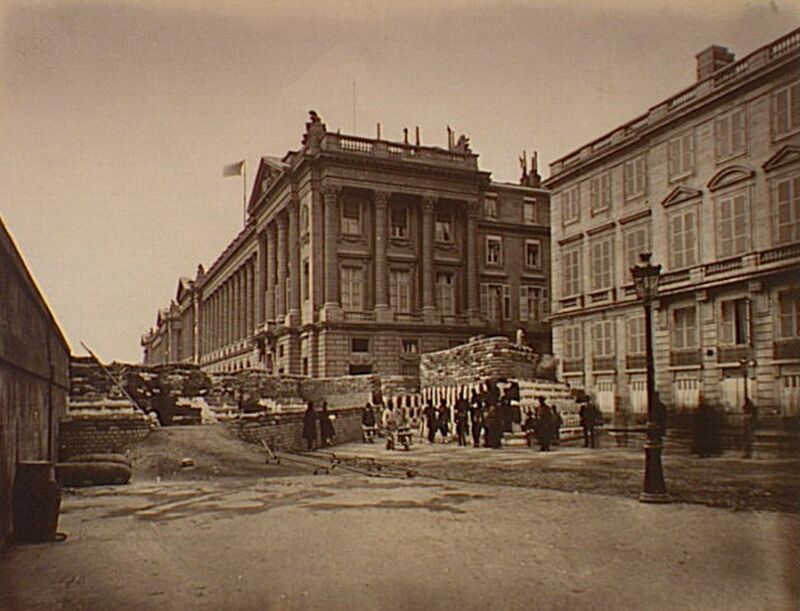 There has been many things written about the urban transformations of Paris orchestrated by Napoleon III’s prefect, the “Baron” Haussmann; many of which address the militarized causes of these transformations, as I often did myself. This aspect of the transformations is admitted by Haussmann himself in his memoirs as part of the strategy. The first part of the 19th-century saw many insurrections and revolutions happening in Paris (1830 revolution, 1832 insurrection, 1848 revolution, etc.) and Napoleon III, after his 1851 coup, was certainly eager to transform Paris to be able to control it. 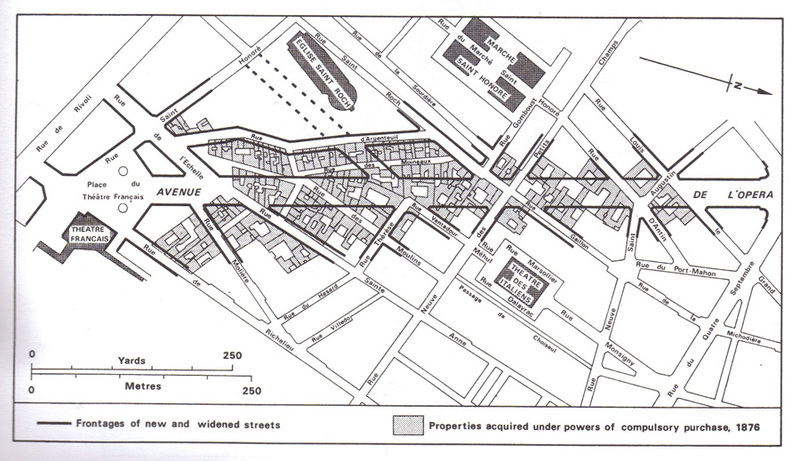 The large avenues and boulevards were thus seen as fundamental components of potential armed interventions of the national army against insurrections. The movement of the troops was thus maximized, the canons could have a clear aiming line, and the dense neighborhood of proletarian Paris were fragmented by these large urban canyons. Another militarized aspect of the transformation also lies in the systematic eminent domain authorized by a 1852 legislation that promises compensations for the moved population but gives it no choice but to be evicted. 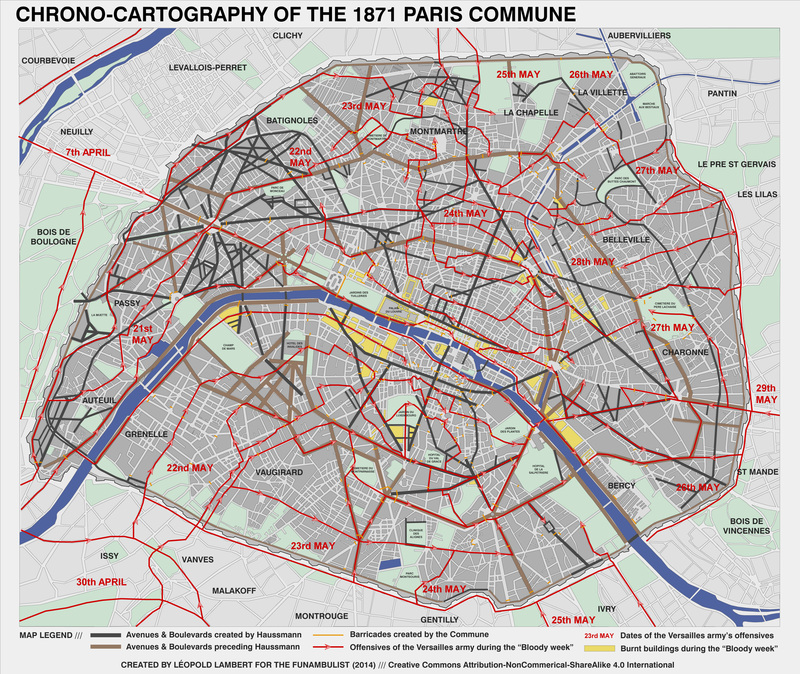 The totality of the transformations was not finished when the Paris Commune occurred in 1871, which can partially explain why the movement of the troops during the bloody week does not coincide so much with the Haussmannian layout as the first map reveals. Another reason — and that is my own hypothesis — might be that the Versailles army did not merely wanted to re-conquer Paris and restore national order; it wanted to eradicate one by one every member of the Commune and thus undertook to go from barricade to barricade, killing around 30,000 Parisians in a systematic cruelty. There would be so many things to write about the organization of the Commune during its three months of existence. I particularly recommend the reading of Prosper Olivier Lissagaray’s History of the Paris Commune that he wrote after experiencing it himself. For the purpose of this article however, I will simply write about the transformation of Paris into a war field during the bloody week. As Eric Hazan recently wrote in a book entirely dedicated to the barricade, this defensive architecture has been used since the 16th-century in Paris (the word itself coming from the barriques = barrels); however, the 19th-century was the era during which it was systematically used during the various insurrections already cited above. 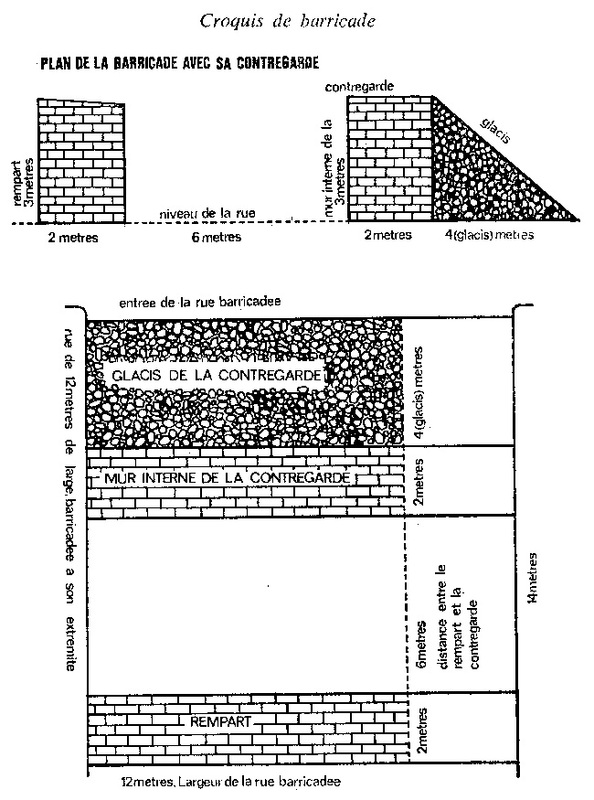 While French Marshall Robert Bugeaud was writing a manual for the army to efficiently anihilate them (see my essay “Abject Matter” for more), the revolutionary mastermind Auguste Blanqui was writing one to precisely describe how barricades should be laid out and built to effectively defend a given neighborhood (see drawing above). The Commune was somehow victim of its democratic functioning: a shoe-maker, Napoléon Gaillard, was named to organize the barricades defending the city. 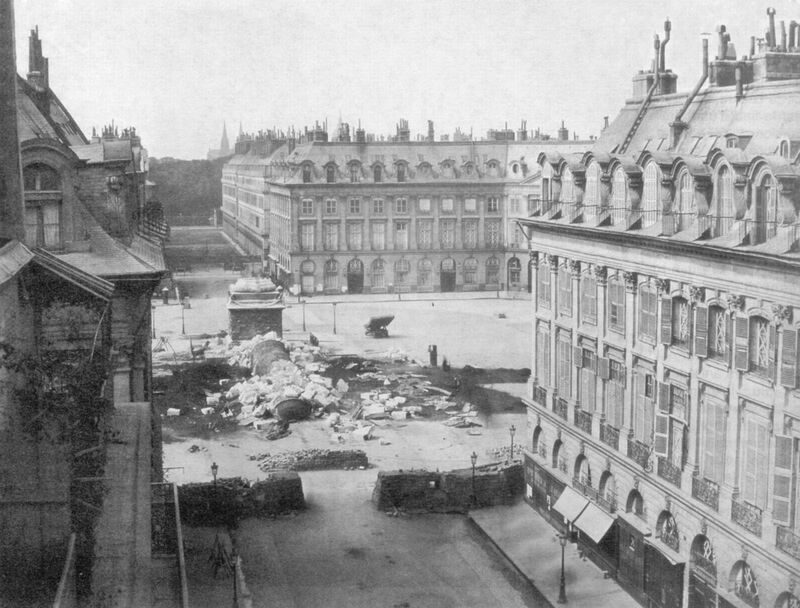 The immense barricade he built on the Place de la Concorde remains as one of the most extreme of history but these efforts were too focused on one place in particular (meticulously avoided by the Versailles army) and the rest of the city’s barricades were built without a global strategy but rather as local efforts to defend the Commune members’ own neighborhoods. The main thing that many historians never forgave to the Commune (hence an often biased reading of it) consisted in the destruction orchestrated by its members. As I wrote in a past article entitled “The Positive Holes of Revolutionary Urbanism,” these destructions were as much symbolical (what was destroyed was highly charged monument to imperialism) as necessary to construct a new city in an attempt to free the latter from the logic that organized it. The May 16 destruction of the Vendome Column (on top of which a statue of Napoleon Bonaparte) organized by the painter Gustave Courbet in ceremonial conditions is particularly paradigmatic of these destructions. 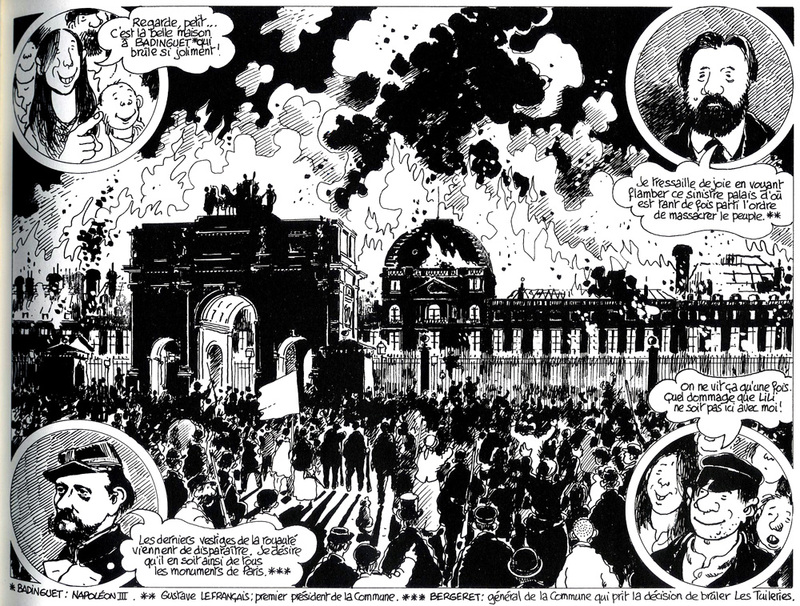 On May 23, during the bloody week, the Palais des Tuilleries was put on fire and burnt for two days. It was never reconstructed. The cathedral Notre Dame was planned to be burn to the ground as well in a strong gesture against the partnership of the Church with imperialism. However, the building was eventually saved by a group of artists and nurses (from the neighboring hospital) arguing that its aesthetic values were superior to its symbolical embodiment. As written above, the systematic machine of death embodied by the Versailles army is effective during the seven days of the bloody weeks. When captured, the members of the Commune are executed; so are people who are caught having powder on their hands. The Commune being a revolution in which women and sometimes children have taken a tremendous part, they are executed in the exact same manner than the men. On May 26, some of the members of the Commune decide to retaliate by executing 50 hostages (ecclesiastics, soldiers and informants) that Versailles had refuse to trade against the liberation of Blanqui. 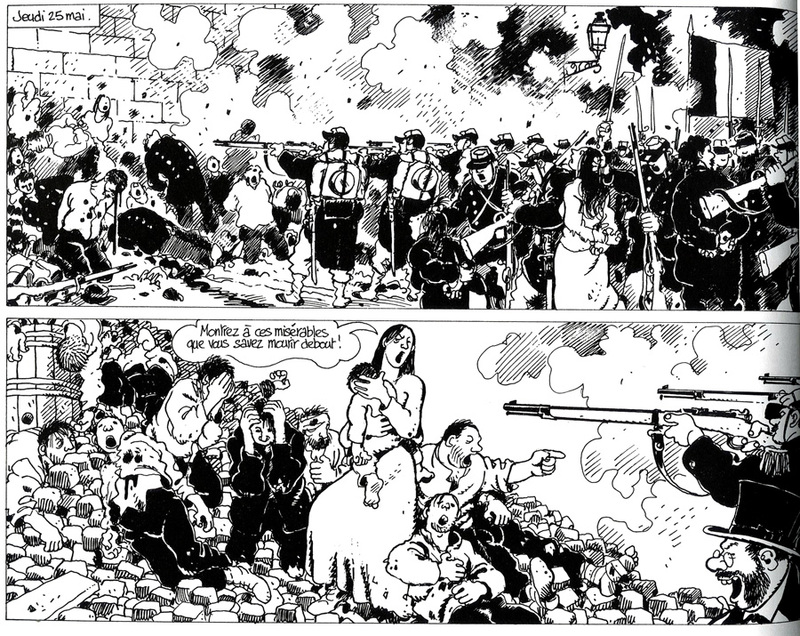 In The History of the Paris Commune, Lissagaray points out that it would have been easy for the army to stop this execution but that Adolphe Thiers, President of the Monarchist Republic (a curious oxymoron), needed these executions as a last graphic legitimization of his pitiless suppression of the Commune. 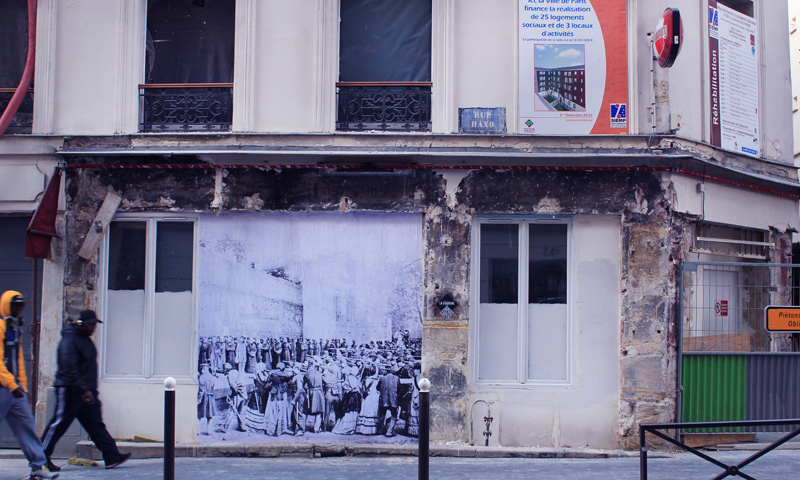 The last neighborhoods that resisted to the army, Belleville and Menilmontant, in the east part of Paris, remain today the rare places where the working class can live in Paris. History tends to describe the city where events unfold themselves, as a mere context, indifferent to the action that it hosts. Through this article, embarrassed to touch only a few of the multitude of actions undertook by the Commune during its short existence, I wanted to illustrate how the city, through its constructive, destructive and modificative logics plays a biased role in these historical events. As Karl Marx pointed out in The Civil War in France (1871), many things could have give the Commune higher chances to survive (a more organized offensive against Versailles in the beginning of its existence, the use of the Banque de France left untouched, a more comprehensive defensive strategy etc. 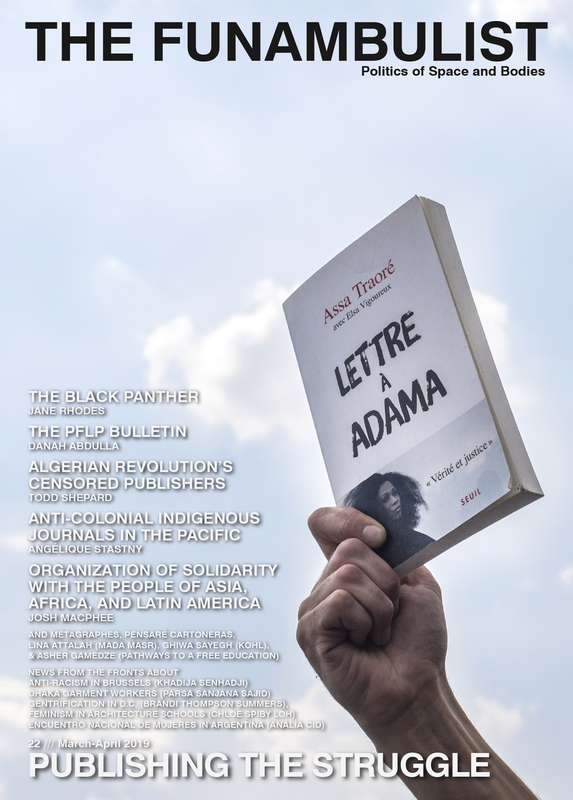 ), but the thing that the Commune has lacked the most is likely to be time itself, in an effort to transform and subvert the capitalist, imperialist and militarized logics that contextualized the urban fabric in which it was attempting to exist. For the readers who understand French, I highly recommend to spend hours on the online Commune project designed by the collective Raspouteam that tends toward an exhaustive descriptions of these three months of existence.